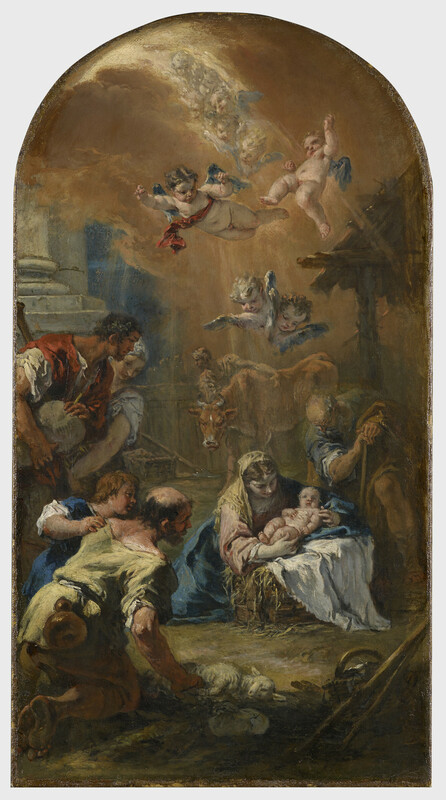 This is a highly finished preparatory oil sketch or modello for Sebastiano Ricci’s full-scale altarpiece of the Adoration of the Shepherds in the Cathedral of Saluzzo, painted by 1723. The Saluzzo commission can be related to other paintings by Sebastiano of the same period, for example the composition and colours in the tondo of the Adoration of the Shepherds in the Villa Guarnieri (Tomo di Feltre) of c.1720, the Virgin with the Archangel Gabriel, and Saints Eusebius, Roch and Sebastian for the chapel of St Hubert in the Venaria Reale (Reggia di Venaria) of 1724–5 and the large Adoration of the Kings (RCIN 405743) of 1726. The modello is painted with fluid, lively brush strokes in brilliant colours to deftly define forms, such as the pink touches on the Christ Child, the dark blue of Joseph’s arm and the fine golden yellow combined with pink for descending angels. The broken, dry strokes of bright yellow suggest the brittleness of straw cascading out of the crib. The figures leaning towards Mary and the Christ Child in strong primary colours, the shepherd’s crooks in the right foreground and the diagonal of the shovel in the left background define the space around the central group. The background figures are in more muted colours. Against the night sky, rays of light dramatically pierce the golden clouds to spotlight the scene below; the central beam is filled with a cascade of angel heads, the uppermost dissolving into ethereal light at the top. There is evidence that Sebastiano was working out his ideas while he was painting the modello. He left a strip about 2.5 cm wide at the right edge less finished than the rest, probably because the proportions of the final altarpiece were to be narrower than the modello. There is a fragmentary stroke on the second column and many small pentimenti, some clearly visible beneath overlying layers: the height of Mary’s head, the position of the head and shoulders of Joseph and the leg and foot of the kneeling shepherd. In the final painting the clouds are darker, making the fall of light more dramatic. Two women have been added in the left background, and the angels hold an inscribed scroll. There are at least three other versions of the modello in existence, all with different dimensions; the scroll held by the angels only appears in the third. Sebastiano’s modello shows the influence not only of Veronese but also of Jacopo Bassano in, for example, the realistic depiction of the shepherds on the left, particularly the kneeling shepherd, the farmworker with the ox and the elderly figure of Joseph. Text adapted from Canaletto & the Art of Venice, 2017.